Freeman, South Dakota, marks the center of the Chislic Circle. Not to be confused with the Chitlin Circuit or Bermuda Triangle, this region distinguishes itself with fried cubes of red meat. For 30 miles in any direction from Freeman, restaurants and cafes serve chislic. Cooks deep-fry the chunks of meat and sprinkle them with garlic salt, adding a toothpick to the center of each morsel. South Dakotans pair the savory finger food with saltines, and a dab of hot sauce might finish it off. Adults tend to wash down the combination with a beer. Many locals who grew up with the dish (which was especially popular in the ’50s, ’60s, and ’70s) remember it as a childhood favorite. Some suspect that the idea comes from Russian shashlyk, made from beef, lamb, or pork cubes grilled over a fire. Historically, families and eateries in South Dakota did opt for lamb chislic, reflecting the waves of German-Russian immigrants that settled in the area during the 1800s. But today, beef and venison are also fair game. As restaurants have adopted a more globally-inspired approach, various marinades and dipping sauces have popped up alongside the versatile meat cubes, as well. Chislic is served in gastropubs, bars, and cafes in the Chislic Circle. This 100-year–old I-90 rest stop is known for chislic baskets, pies, and buffalo burgers. 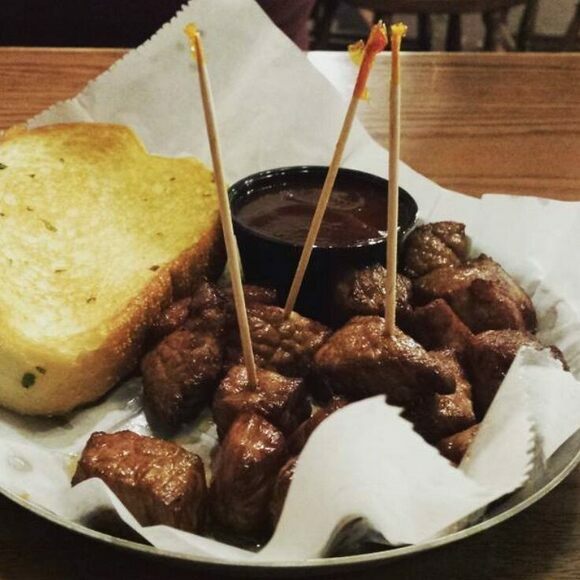 This Sioux Falls mainstay features inspired American classics and South Dakotan specialties such as chislic. An upscale, eclectic restaurant serving chislic. South Dakota's unique contribution to World War II soldiers. This decadent schnitzel stuffed with clotted cream is named after the leader of Serbia's fight for independence.